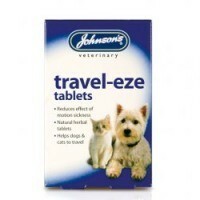 Johnson's Travel-eze for Dogs and Cats are a brilliant product for both dogs and cats who do not travel easy. Developed using herbal ingredients, these tablets help minimise the symptoms of motion sickness. These effective tablets contain the natural, nerbal ingredient zingiber officinale, which works to ease the effects of travel sickness. Administer Johnsons Travel-Eze Tablets 30 minutes prior to traveling, and for longer journes repeat the dose when stopping for a break.